Have you seen the gorgeous cover for Jessica Spotswood’s Born Wicked? The raised lettering and rich colors are so beautiful! Here is the synopsis for this paranormal romance, which is the first in a planned trilogy releasing next month. Win an Advance Readers Copy! The book won’t be available until February 2012, but to celebrate the new year we’re giving away a copy of this coveted ARC! To enter, simply fill out the form below. You can also earn additional entries by tweeting about the giveaway, becoming a Facebook friend, etc, and the contest IS open internationally. The winner will be announced and contacted on Friday, January 13. Good luck! Thanks for making it international, guys! Thank you for the chance to win! I have been wanting to read this book. 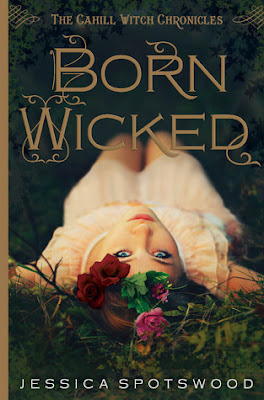 So very excited to have a chance to win an ARC of Born Wicked! Sounds fascinating! Thanks for the great giveaway!! this book looks so great!! DYING, DYING, DYING to read this. And yes, probably the most gorgeous cover I have seen as of late! Thanks for the giveaway (crossing fingers and toes)! Thanks so much for the giveaway :) I can’t wait to read this book! I haz no avatar, but it’s me, Cillian. I should have a google id, yes? Thanks for the giveaway..can’t wait to read this. I’ve heard this book is AMAZING! Thanks so much for the giveaway! Awesome giveaway! Have been waiting for this one! Epic giveaway! I want to read this so much! Thanks for the chance to win =] New follower. I was pretty much in as soon as I saw “A Great and Terrible Beauty.” :D Sounds like an awesome book. Thank you for the giveaway! Thanks so much for this (and for making it international). Really excited about Born Wicked! Looks great :). Can’t wait to read this. Thanks for the giveaway! Love the cover, really pretty! Your blog is so pretty! Thanks for the awesome giveaway, this book sounds so good! BTW – Your blog is lovely. thx for making this an Int! Witches are cool! Thanks so much for this giveaway! I love witches! Thanks for an awesome giveaway! I’d LOVE to read this (and post a review on my blog). I’m so glad I found this blog today, I was missing you over at the craft blog, but found you from SB today :) Thanks for the amazing giveaway! Did someone say a giveaway? Count me in! Thanks for the opportunity to win, Wendy! So excited to read this book! Thanks for giving it away! You have the best taste in books. This cover is really pretty! And it sounds like this is a great read. Thanks for the giveaway! I’m desperate to read this book! It sounds amazing. Ooh I’ve wanted this for so long. Great giveaway. I’m so excited about this book! Thanks so much for hosting this amazing giveaway! Thanks for the contest! I was really interested in this one, though I’ve been a little put off by some reviews, but I always like to see for myself. I loved Gemma Doyle. I definitely want to read this book! Thank you for a giveaway. Yay, thanks for this giveaway! I love the cover for this book, and I’m intrigued by the premise! Ahaha, I just realised when you linked this post that although I have this blog in my bookmarks, I wasn’t following it! It’s definitely rectified now. I wasn’t really interested in this book at first but I get curious every time I hear about it. I feel like I’ve been waiting for this one forever! That cover is so beautiful ;) Oh, and the story sounds good too, lol. I can’t wait for this book. That cover is so gorgeous! Eeeep, the excitement! Cannot wait for this book. Thanks for the giveaway! CANT WAIT for this book! thx for the giveaway! Thanks for the chance, WD! I really want to read it, thanks for the international giveaway!! Looks like a fantastic read! Thanks for the giveaway! thank you for this great giveaway, I’m very curious about this book. I haven’t heard of this one yet, but it sounds really interesting. This cover is fantastic! And the book sounds pretty darn great too :) Thanks for the Giveaway! Thank you for this giveaway! I have been eyeing this book for awhile now! Love the cover! thank you for this awesome contest! i love the cover! I love the cover! I can’t wait to read it :) Thanks for the giveaway! Ooh fab! This book sounds so great, is the review up yet?? I am super-excited for this book. I can never get enough witchiness, especially when sisters are involved! And that cover is gorgeous! Thanks for the giveaway! Thanks for doing this giveaway! Had my eye on this one for a while. Awesome! I am glad you are doing some big changes on the blog! It will be better than ever! Yay! I’m dying to read this! Oooh this is on my tbr list! thanks! Thanks for the EPIC giveaway! Oooh, nice giveaway. :) I’ve heard good things about this one too. I WILL LUV YA FOREVAH AND EVAH. Seriously, you’re too cool for doing this. I’ve been so anxious for this one! Thanks for making the giveaway international. I’m so excited about this one! Thank you for making it internationally! Everyone seems to go ga-ga over this book! I think I’m going to jump into the melee :) Thanks for the giveaway!